Taberu Rayu is at every supermarket I visit in Japan. What started as one product by one company has exploded to many variations. One of the most interesting ones I have come across is the basic taberu rayu without the oil. As you can see by looking inside the jar, it’s very different from the original version. The SB Foods website says that it is 20% less calories and 40% less fat than the original version. There is a lot of crunch from the fried garlic and almonds. Here it is simply on rice. We love it. Much better than the oily version which makes the rice greasy and hard to eat. 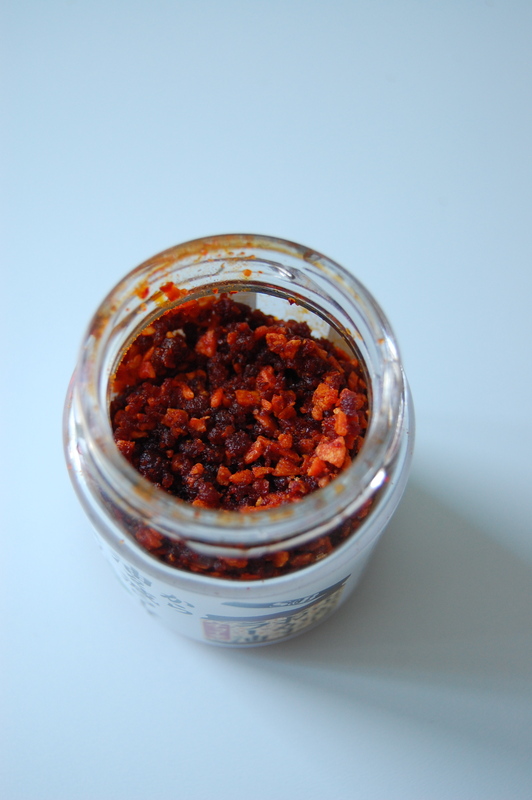 The SB Foods website offers many recipe ideas for this product. Even if you don’t read Japanese you’ll be able to sort out several of the recipes just from the photos. And, I don’t care for wasabi much, but I imagine this okazu wasabi would be a big hit back in the States. Great news for tourists visiting the Tokyo’s hottest destination, Tokyo Sky Tree. You don’t have to go to Kappabashi to get your plastic food samples. Ganso Shokuhin Sanpuruya has a branch in the new Solamachi shopping mall. The original store is in Kappabashi and is very popular. 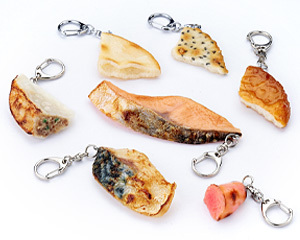 Here you’ll find the great plastic food samples that are usually found in front of restaurants. As well as many miniature versions for refrigerator magnets or keychains. And, for the very creative, you can pick up your own kit to make your own bowl of plastic food like spaghetti or ramen at home. I have a few sushi magnets and love them. Great gifts for your foodie friends. *photos come from the Sky Tree Solamachi site and the Ganso site. 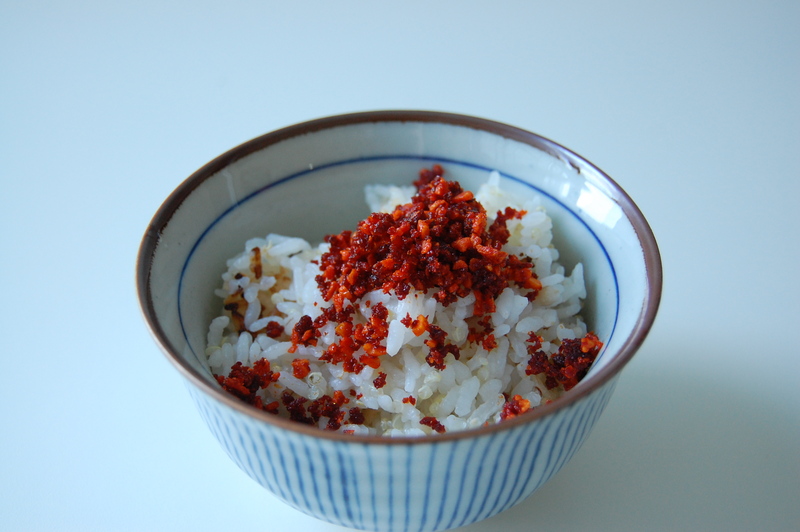 The popularity of taberu rayu has been a great food trend to observe. First was to see all of the copycat versions imitating the original taberu rayu. Now, there are many new products that are similar in style but made from totally different ingredients. 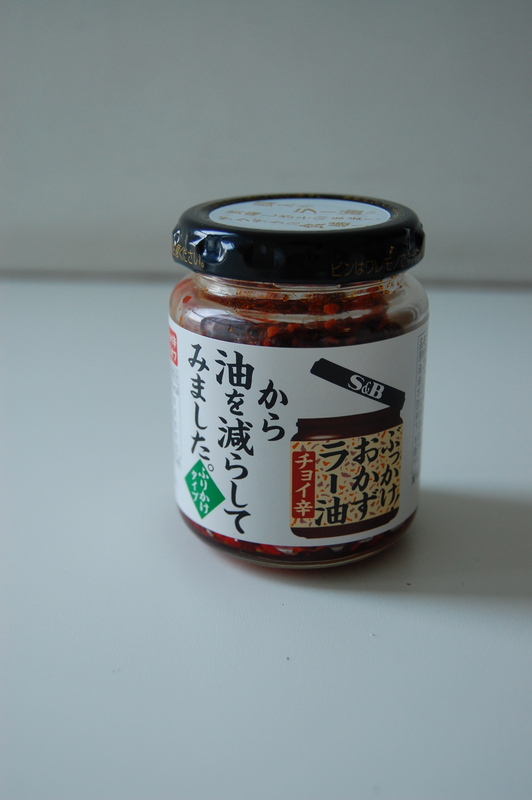 One of our new favorites is this Saku Saku Taberu Kobashi Shoyu from Kikkoman. 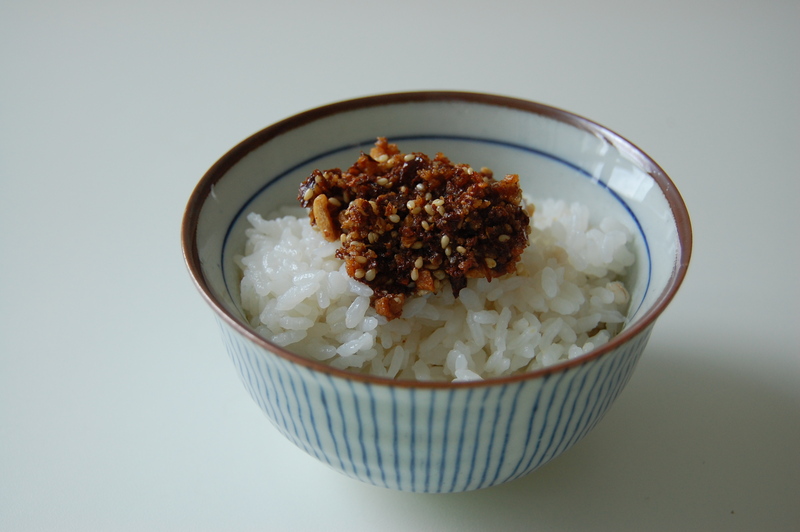 The oil based condiment is made with freeze-dried soy sauce flakes, fried garlic, fried onions, sesame seeds, almonds, and more spices. Over rice it was good but we found it a bit oily. The bottle suggests putting it over boiled vegetables or stir-fries. We also had it over steamed greens which was better than the rice. However, our favorite is over sake-steamed fish. The contrast of the crunchy condiment and the juicy, flakey cod was perfect. Seasoning also a perfect match. 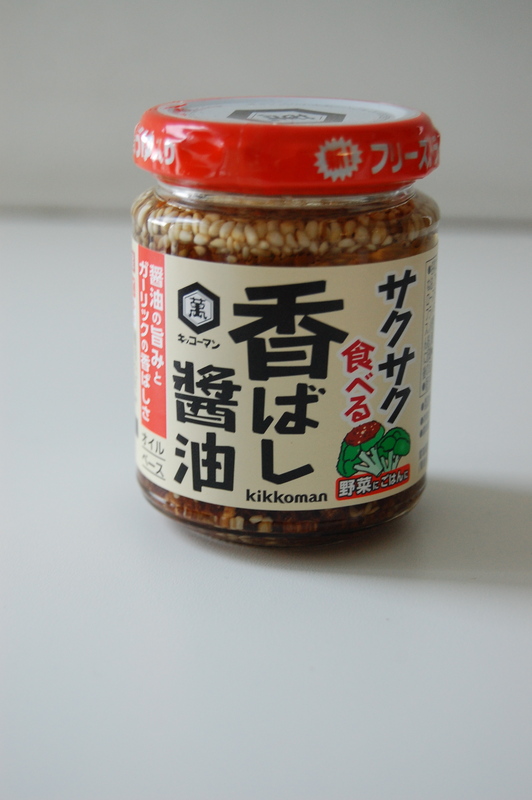 Kikkoman has two other similar products. Taberu Shoyu Yuzu-fumi which is seasoned with yuzu and a Taberu Shoyu Torigara Su-pu Aji that is flavored with chicken soup. It is sold in a glass jar. 105 grams for 350 JPY. 1. 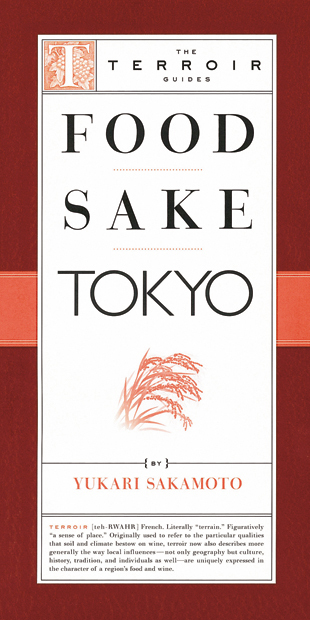 Pick up my book, Food Sake Tokyo, published by The Little Bookroom. The first half of the book covers the basics of Japanese food and beverages. 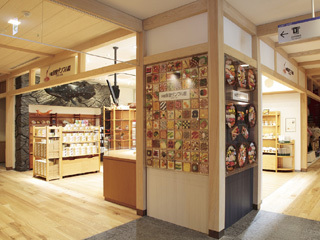 From depachika, seasonal seafood, soy products, wagashi, sake, shochu, etiquette, and much more. The second half of the book lists shops and restaurants by major stations in Tokyo like Tsukiji Market, Kappabashi, Ginza, Kagurazaka, Nihonbashi, and more. 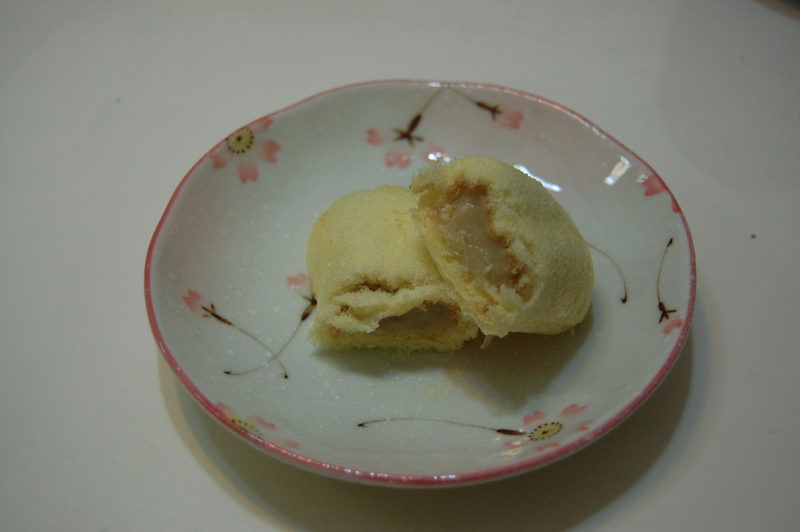 I also include two itineraries for foodies to make the most of their time in Tokyo covering the popular foodie spots. 2. Refer to this blog. I update changes to the book as well as list current food events in the city and introduce restaurants and shops. I also include food items or beverages you may want to check out while in Tokyo. 3. Metropolis magazine is “Japan’s No. 1 English magazine”. Based in Tokyo it covers the food scene. Lots of restaurant reviews and interesting interviews with chefs and other food and beverage people in Japan. 4. Taste of Culture is Elizabeth Andoh’s great cooking school. I have taken several classes from pickle-making to seafood. I always learn so much and leave her classes more pumped up to study more. Check her calendar to see if she is offering a class during your visit. 5. Sake guru John Gauntner offers sake tasting classes from time to time. Check out his website, Sake World, for more details. There is also great information here about sake and where to go in the city for good sake. 6. My friend, Junko Nakahama, is a food and wine writer. She also does very interesting tours of Yanesen. Yanesen is a hip area with lots of old shops, many of them selling great food. Her site, Omiyage Concierge, gives more details. 7. Ivan Orkin is a Culinary Institute of America trained chef making some of the best ramen in Tokyo according to some of Japan’s toughest ramen judges. He has two shops and if you’re lucky he’ll be there when you visit and he can educate you on ramen. Ivan Ramen. 9. Depachika are the epicurean basement floors of department stores. I worked at Nihonbashi Takashimaya for two years and still could not stay on top of all of the different food that was sold there. My favorite depachika are listed here. 10. 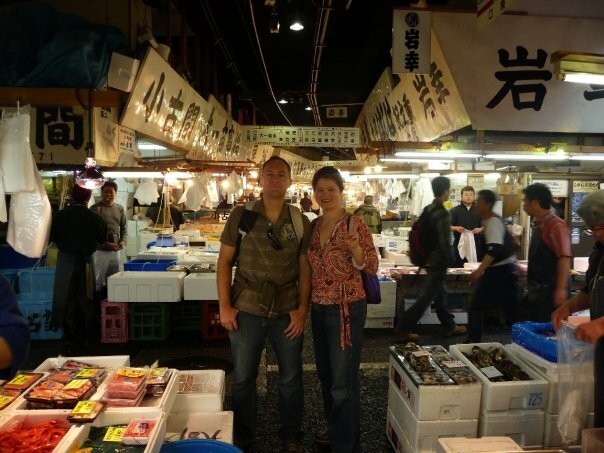 Tsukiji Market, the world’s largest seafood market. My husband was a buyer here. The outer market is open to the public and is filled with great restaurants and shops. 11. Robbie Swinnerton is the restaurant reviewer for The Japan Times. 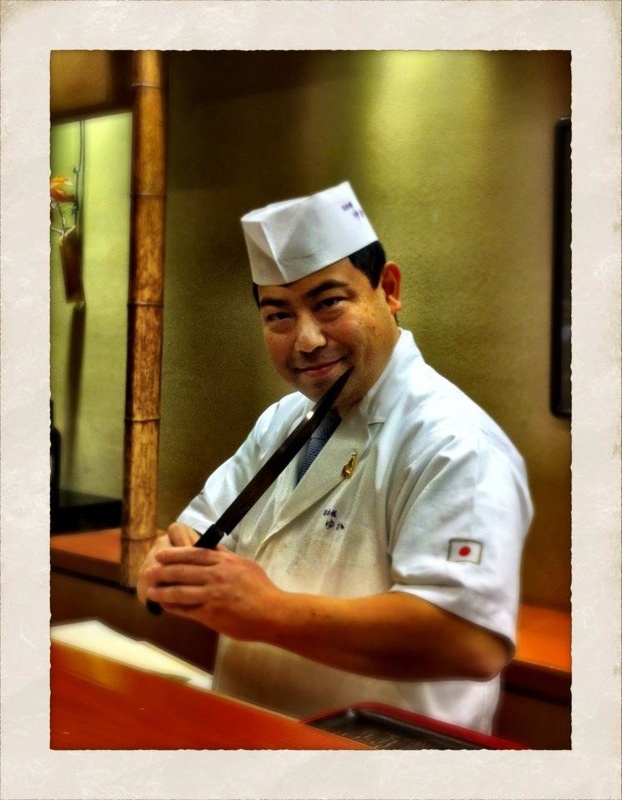 You’ll find his reviews here as well as other great information on food in Japan. 12. Shop at the local Japanese supermarket. Here is my list of local markets in the city. These are not farmer’s markets but local grocery stores. If you are looking for a big market with wide aisles that you can cruise around with a pushcart then head to Kiba to Ito Yokado. It’s a few stops from Tokyo station on the Tozai line. 14. Here is a list of what and where to eat which includes the most popular foods and restaurants. Walking through Tokyo Station it is hard to miss the booths selling Tokyo Banana. It’s a very omiyage. I’ve received it as a gift twice in the last few months. 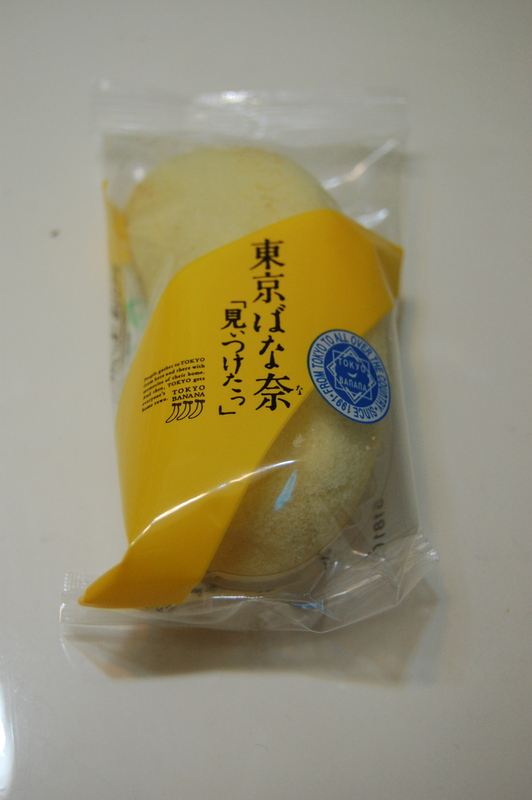 The banana-shaped cakes are individually wrapped. 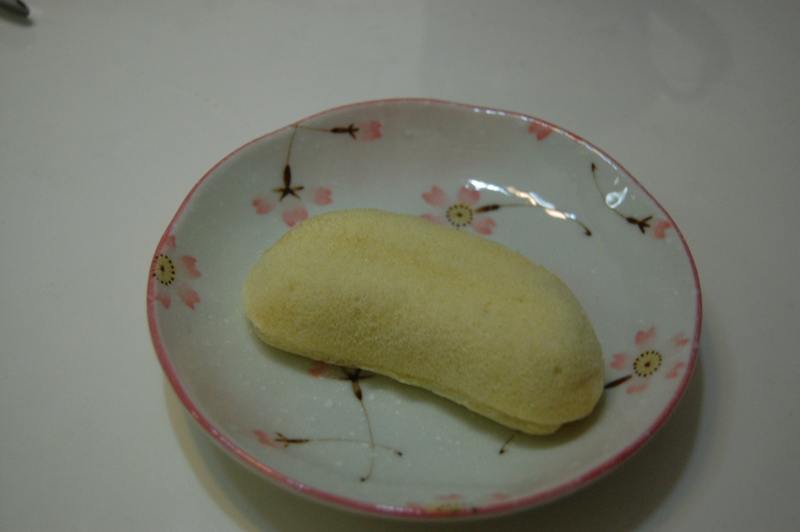 It’s a soft sponge cake filled with a banana cream custard. New flavors are introduced from time to time. 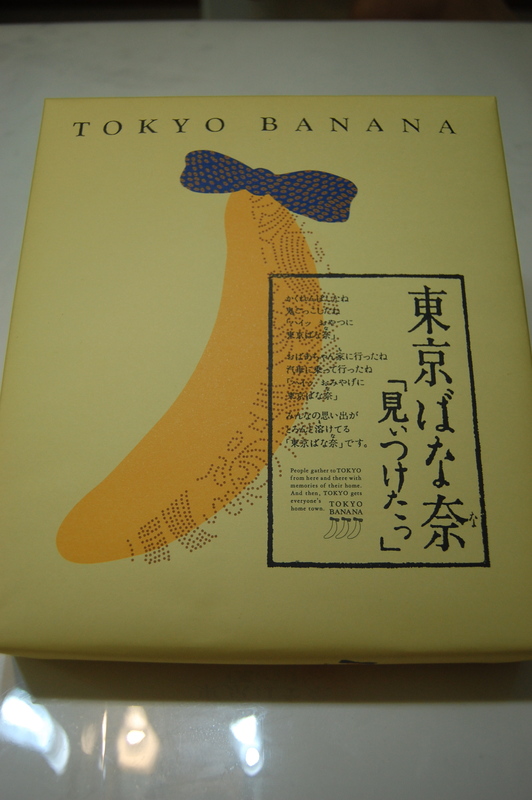 Currently Tokyo Banana is celebrating their 20th anniversary and are offering a caramel banana version. You can see a list of their many different sweets here. Many of the seafood from March are still in season in April. 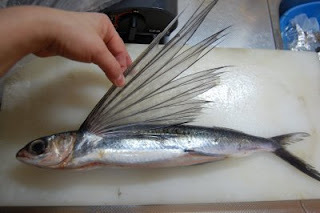 The cold waters still bring fish rich with fat that shines in sashimi or is nice for grilling. Asari clams are great for making into a quick vongole style pasta. Nishin can be salted and grilled. And perhaps my favorite this time of year is katsuo simply seared on the edges, sliced thickly, and served with some soy sauce and garlic. Katsuo tataki is particularly nice if you can garnish it with fresh myoga. Hotate we like as sashimi or cooked meuniere style. Takikomigohan of scallops is also a nice change-up. Mebaru is a light, white fish that is nice as himono. Don’t throw away the head of tai as it is lovely when salted and grilled. Shinji also likes to keep the bones of tai after he has filleted the fish to make a broth. Simply make some kombu dashi, add the bones and simmer for about ten minutes. A delicate broth, but rich with the umami from the fish bones and kombu. As for octopus, which is one of my favorite seafood if cooked properly, there are so many recipes. 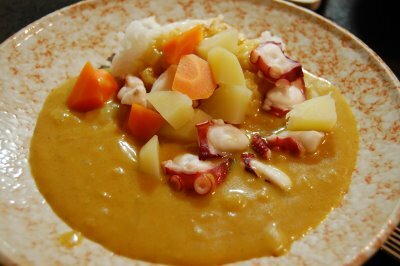 Shinji and I visited an octopus processing factory and the staff there suggested putting boiled octopus on top of Japanese curry. 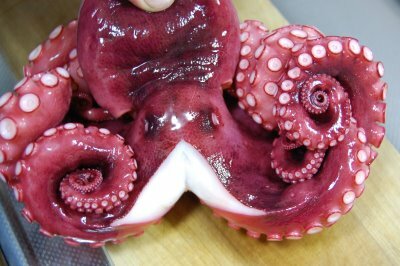 It’s so easy as boiled octopus is often sold in Japanese supermarkets. And, it’s yummy. If you are in Tokyo, be sure to visit Tamai in Nihonbashi, near Takashimaya, for anago which is in season now. If you click on the Japanese name of the seafood you should be directed to a link with a photo.